I'm sitting and waiting patiently for the live taping of next week's episode of Photoshop User TV podcast in the NAPP theatre. If you haven't tune into Photoshop User TV, you should try it this week. It's filled with Photoshop tutorials and tips. Best of all, it's free! You can download it from Photoshop User TV or if you use iTunes, you can download it through the podcast section. Have fun watching and learning Photoshop. 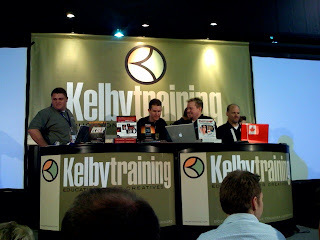 Scott Kelby and his co-hosts Dave Cross and Matt "rockin' the houski" Kloskowski are so funny. They make learning Photoshop easy.